The white robe came off, and the red bandanna came on. And then the Rev. Paul Ogalo emerged in front of his open-air congregation with a microphone. The Catholic priest started rapping and the nuns started dancing. Everyone from teenage boys to middle-aged women, dressed in their Sunday best, circled around Ogalo as he waved his hands and kicked his feet and spread the gospel in a string of rap verses to the beat of drums, all in his native language. It was May 6 and Ogalo - or Sweet Paul, as his fans call him - had recently become a viral sensation. 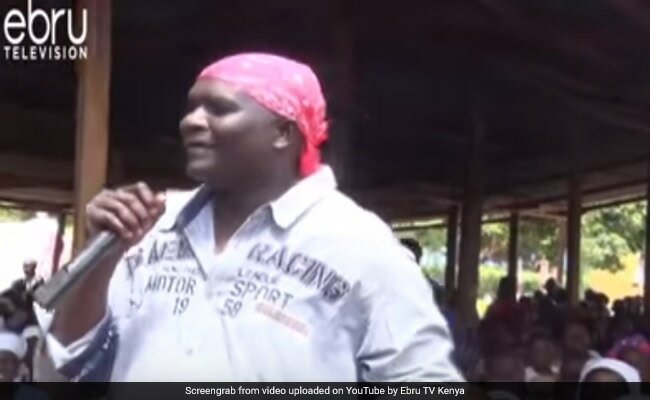 Somebody had posted a video of him rapping on social media - that time while wearing both his white robe and red bandanna at once - and instantly it seemed all the churchgoers in Kenya wanted to know who this rapping priest was. So on May 6 Ogalo invited news crews to come find out. "Usually I do this thing separately. Liturgy remains liturgy. And then the entertainment remains separate, so that I attract the young people to come to church," Ogalo told Kenya's NTV that day. "I use that as a way to bring them to church and catechize them and make them productive citizens of the nation and the Catholic church. That is my mission." But while Sweet Paul may have been a hit with the youth, the Catholic Church was apparently not pleased. Bishop Philip Anyolo, of the Catholic Diocese of Homa Bay, confirmed to a number of Kenyan and international news outlets this week that the church suspended Ogalo from leading mass for one year because "the use of rap music in preaching is not allowed," as he told Kenya's Nairobi News. For the duration of his suspension, Anyolo said Ogalo will still be allowed to attend mass at his parish, St. Monica Catholic Church in Rapogi. "We have just stopped him from preaching using rap to accord him time to change his ways," the bishop told Nairobi News. The Rev. Charles Kochiel, judicial vicar of the inter-diocesan tribunal of Kisumu, told the Catholic News Service that there are "certain things the church promotes in the society." "If we mix . . . what the secular and church institutions do," he said, "then definitely people are going to read different messages." In an interview with BBC last month, Ogalo said he was inspired to start rapping the gospel after young people were trampled to death at a music event in Nairobi, in 2004. "I said, this should not happen anymore," he told BBC. "If young people want entertainment, they can come to church to play, to pray and to entertain themselves." Ogalo started writing songs, seeking to steer young people away from drugs and prison and toward the church and a productive lifestyle. He said he's used drama, martial arts and poetry, too, to teach about issues such as HIV/AIDS and climate change, traveling around to schools or other community centers to reach them. "We try to help young people understand what life is and also to use art to vitalize the world," he told NTV May 6. "We have a lot of manpower. Our youth is so vibrant. We only need to help them to nurture the potential in them." He wanted his stage name to be Paul S.W.I.T., standing for Paul Sees the World in Turmoil - but "my fans don't want that," he told NTV in a follow-up interview. "They want Sweet Paul, for flavor. They say I rap sweet, I dance sweet." But he acknowledged that when he mixed his rap with his sermon - and his bandanna with his robe - "that was something regrettable." Ogalo could not be reached for comment early Thursday. The Diocese of Homa Bay and the Kenya Conference of Catholic Bishops did not immediately return requests for comment.